Have you seen citrus with these symptoms? 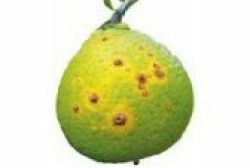 Citrus canker has been detected in the Northern Territory and Western Australia. The Biosecurity (Citrus Canker) Amendment Regulation 2019 under the Biosecurity Act 2014 is now in place for citrus canker and carriers of citrus canker. This means that host plants, planting materials and equipment may not be brought into Queensland, unless they meet certain conditions as outlined in the Regulation and the Queensland biosecurity manual (PDF, 1.9MB). An industry alert has also been issued. 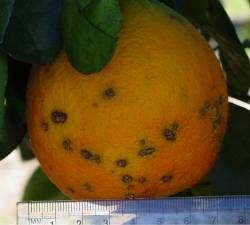 The measures are to prevent the disease spreading into Queensland’s citrus production areas. In Queensland, citrus canker is prohibited matter under the Biosecurity Act 2014. Be on the lookout and report citrus canker to Biosecurity Queensland on 13 25 23 or the Exotic Pest Plant Hotline on 1800 084 881. Do not touch suspect citrus canker lesions or move plant material off your property. This can spread the disease. Early detection and reporting are key elements in controlling this disease. Citrus canker is a contagious plant disease caused by the bacterium Xanthomonas citri pv. citri, affecting citrus and some other plant species. Citrus canker does not pose any risk to human health. 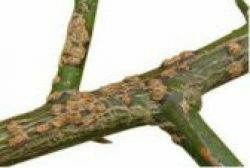 Citrus trees infected with citrus canker display unsightly lesions which can form on leaves, fruit and stems. 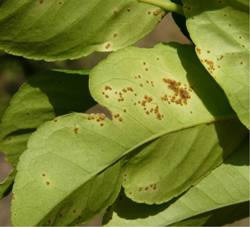 Trees infected with the disease may suffer from low vigour and a reduction in fruit quality and quantity. The disease has serious economic impacts on citrus production and is the subject of a number of control and eradication programs around the world. In Australia, citrus canker is an exotic disease. Historically, there have been several outbreaks: in the Northern Territory in 1912, 1991 and 1993, and Queensland in 1984 and 2004. All were successfully eradicated. Citrus canker was recently detected in the Northern Territory in April 2018. Following tracing and testing of nursery plants from the Northern Territory, there are confirmed, linked cases of citrus canker on a small number of properties in Western Australia’s north. A nationally coordinated response program is currently underway to eradicate the disease. The bacterium causes the development of blister-like lesions on host leaves, fruit and stems. multiple lesions on fruit or stems are typically only seen in cases where the foliage is severely affected. The disease causes abnormal leaf fall, poor tree health, dieback, blemished fruit and premature fruit drop. 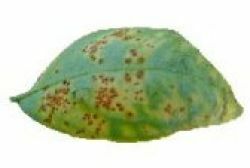 Leaf, fruit and stem tissue may be infected. Leaf tissue offers more opportunity for infection and as such typically displays the most numerous lesions over time. The disease usually becomes more active in early spring. The highest risk for new infections is during active growing periods when fresh shoots are emerging. Conditions for development of the disease are optimal in warm temperatures, and spread is highest in periods of high rainfall and strong winds. 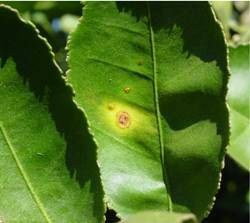 Lemon scab caused by the fungus Elsinoe fawcettii also causes scab-like lesions, predominantly on lemons in coastal regions. 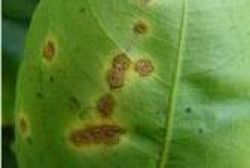 Lemon scabs appear drier looking than citrus canker and to not have a yellow halo. If you suspect citrus canker, don’t hesitate to report it. The disease is widespread in many tropical and subtropical citrus-growing areas of the world. In early 2018 detections of citrus canker were made in the Northern Territory and in Western Australia. These detections are currently the subject of nationally coordinated response program. Bacteria ooze from the lesions and are spread predominantly by rain splash. In rain storms, bacteria can be carried between trees over distances up to 100 m. The bacteria enter the plant through stomata or through wounds caused by wind driven rain, mechanical wounds caused by equipment, and wounds caused by insects such as citrus leaf miner. The disease can become less active (latent) when the weather is dry for long periods, and then become active again in periods of high rainfall and warm weather. Many citrus crops can be affected by citrus canker. These include orange, mandarin, lime, lemon, citron and grapefruit. Citrus and Fortunella species and their hybrids including orange, mandarin, lemon, lime, grapefruit, kumquat, calamondin, tangelo, pomelo, citrus rootstock and native citrus species such as Citrus australasica (finger lime), C. gracilis (Humptydoo lime) and C. inodora (North Queensland/Johnstone River lime). The Regulation contains a full list of host plants. surrounded by an oily, water-soaked margin and a yellow ring or halo. Large or older lesions may have a crater-like appearance. 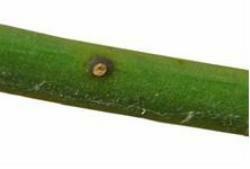 Leaf, fruit and stem tissue may be infected. Leaf tissue offers more opportunity for infection and as such typically displays the most numerous lesions over time. It is unusual to see multiple lesions on fruit or stems if lesions are not present on leaves. Citrus is a significant crop in Australia, there is over 28,000 hectares of citrus planted and around 1,900 growers (Citrus Australia, 2016).For the year ending June 2017, citrus production was valued at $724.4 million, with Queensland the largest producer of mandarins. The high quality of Australia’s citrus fruit results in citrus being Australia’s largest fresh fruit exporting industry by volume, with exports of oranges, mandarins, lemons, limes and grapefruit, totalling 260,209 tonnes worth $427 million in 2017 (Plant Health Australia, n.d.). Citrus canker causes plant defoliation, unsightly fruit blemishes and premature fruit drop. This leads to decrease in fruit production and a reduction in saleable fruit. Farmers can experience production losses and trade bans as the presence of citrus canker can affect domestic and international export market access. In order to prevent the disease from spreading, affected growers properties may be quarantined. Citrus canker can also have significant economic and emotional impacts on individual growers, their families and the communities that support them. Home gardeners may also be affected as citrus is a common backyard plant. Human health is not affected by infected plants and fruit. The key method of preventing citrus canker entering your farm is to use certified disease-free planting material and have robust on-farm biosecurity systems in place. The canker lesions ooze bacteria when wet. Over short distances, wind-driven rain, air currents, insects, birds, human movement and equipment such as overhead or spray irrigation systems can spread the bacteria. Citrus canker can be moved and spread over longer distances on equipment (vehicles, tools, mechanical hedgers, sprayers, gardening equipment) and people (hands, shoes and clothing). Movement of infected plant material, or airborne movement of bacteria as an aerosol or debris during severe weather events (where strong winds and rain are present), can also spread the disease further. The disease is not transmitted by seeds. Illegal importation of infected plant material poses the greatest risk of introducing this disease into Australia. The Australian Government closely monitors for illegal plant movements and regulates approved host plant imports. Infections typically become active in early spring. The highest risk for new infections is during active growing periods where fresh shoots are emerging. Conditions for development of the disease are optimal in warm temperatures, and spread is highest in periods of high rainfall and strong winds. Citrus canker is typically recognised by its characteristic symptoms, and can be detected during routine orchard inspections. 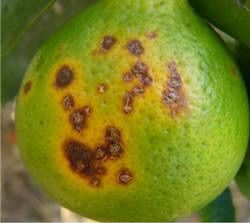 If you see symptoms that resemble citrus canker infection, contact Biosecurity Queensland on 13 25 23 and they will advise how to take action. There are simple steps you can take to protect your farm. To avoid introducing citrus canker on to your property, establish new plantings with healthy plant material from reputable nurseries that use Auscitrus seed and budwood, which is routinely tested for a range of diseases. On receipt of any new plants, check that they are pest and disease free. If citrus canker is detected, isolate suspect nursery stock from healthy plants until official checks are completed. Keep your farm clean. Use good sanitation and hygiene practices. Remember that workers, visitors, vehicles and equipment can spread diseases. Make sure equipment is clean before it enters your farm. If you have been to an overseas country that has citrus canker, do not wear your travel clothes into your orchard until after they have been washed in hot soapy water. Make sure that you and your farm workers are familiar with the symptoms of citrus canker. Regularly check your orchard and report any unusual or unfamiliar symptoms. Citrus canker is a prohibited matter under the Biosecurity Act 2014. 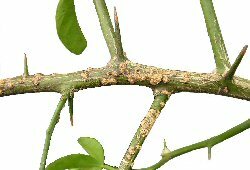 Report suspected citrus canker to Biosecurity Queensland immediately on 13 25 23 or contact the Exotic Plant Pest Hotline on 1800 084 881. If you think you have found citrus canker, you must take all reasonable and practical steps under your control to minimise any associated risks or spread of the disease. This is called a general biosecurity obligation (GBO). Do not touch or move infected plant material. Find further details about your GBO. Interstate movement controls have been implemented to prevent entry of citrus canker hosts and carriers, such as fruit, plants and plant material, soil, equipment and machinery, from the Northern Territory or Western Australia into Queensland. For further information read the Regulation and the Queensland biosecurity manual (PDF, 1.9MB). Queensland has a movement control order in place for citrus canker. You may not move any host plant, planting media, soil, or machinery and equipment that has been used for production. If the disease is suspected please call Biosecurity Queensland on 13 25 23.